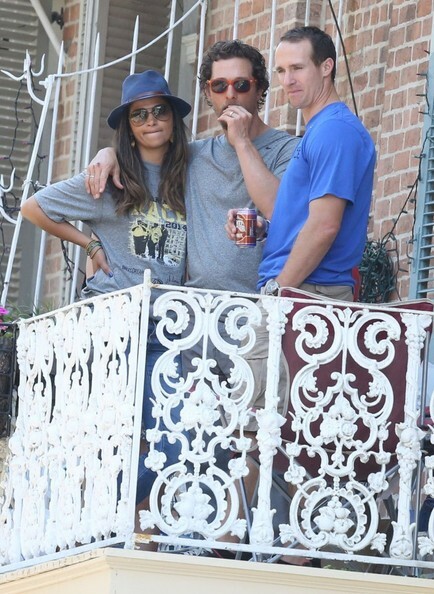 'Dallas Buyers Club' actor Matthew McConaughey and his family participate in Drew Brees', The Brees Dream Foundation charity fundraiser mimicking the Amazing Race in New Orleans, Louisiana on May 17, 2014. Contestants have to find Matthew and yell out 'Who Dat', when they do Matthew throws them a football with a clue. Right across the street from Matthew is his good buddy Brad Pitt who comes out to say hello and toss some beers over to Matthew and Drew.